Millimeter wave technology will require a whole new approach to ensuring reliability. Add one more industry to the long list that analysts expect 5G technology to disrupt—test. While the initial versions of this wireless technology will be little more than a faster version of 4G, concern is growing about exactly how to test the second phase of this technology, which will be based upon millimeter wave. There is no way to attach testers to antenna arrays needed to receive millimeter wave signals. The general consensus is this will have to be done over-the-air (OTA), but so far this kind of testing technology doesn’t exist. It’s not clear how to test whether the receiving technology in the handset is reading the signals appropriately, due to mmWave signal attenuation and interference. Those signals can be disrupted by people, foliage or even weather, but figuring out whether it’s a hardware problem or a signal problem—and the source of that problem—isn’t trivial. Likewise, the base station technology will require beam-forming technology to circumvent those objects and various types of interference. Whether that technology is working as planned, or whether it’s a problem with the handset, or both, will need to be part of the test strategy. So far, there are no clear answers yet about how to achieve this. The test industry has made some strides. But where tests do exist for 5G technology the process today is manual, which means slow and costly. So while the United States’ FCC 28GHz spectrum auction fired the starting gun on chipmakers racing to release the first commercial millimeter-wave chips, no commercial, manufacturing-ready test-and-verification systems are yet able to do the work. Testing routines under 5G will require new techniques and automation to deal with the idiosyncratic requirements of 5G systems. Other changes will be organizational to deliver more testing officially. Others will require changes in attitude to acknowledge the increasing importance of 5G in the day-to-day lives of customers—although it is still too early to know whether 5G will fulfill the incredibly high expectations for its service. The pressure is already pushing some customers to blur the lines between development and testing. They are buying ATE to install in development labs—rather than test and verification departments—to help chip designers troubleshoot designs for prototypes more quickly, for example. What works best where remains to be seen, but devising test strategies based upon all of these changes becomes increasingly challenging, and the problem only grows with each new piece of the technology. The shift to higher frequencies and the need for high-gain beamforming requires a phased-array antenna containing potentially hundreds of antenna components, each with its own RF connection. That makes the traditional practice of testing RF using a cable connecting transmitter and receiver impractical at best, and often impossible. Beamforming also makes it impossible to test radio and antenna elements separately, as is common now, because the relevant result is not how much energy the antenna is able to put out, but how effectively it uses amplifiers and phase shifters and other components to direct the energy to a specific target and receive the result correctly, says Michael Foegelle, director of technology development at ETS-Lindgren, which sells kits and components for commercial test systems, including OTA testing of sub-6GHz 5G systems. 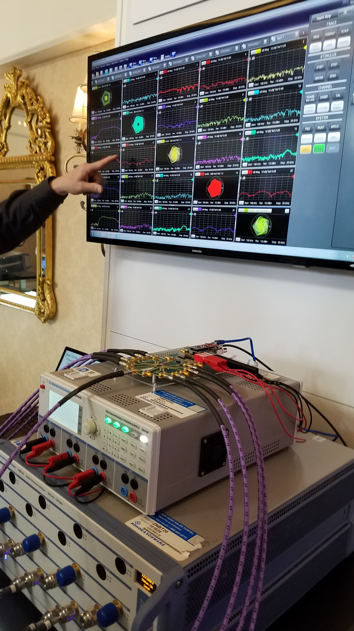 “5G antennas are hard to test because they don’t stop changing—they’re constantly modifying themselves for beamforming or to do MIMO (multiple input and multiple output), with advanced signal processing behind that, so it’s always changing its performance from a single angle or point of view,” according to Lawrence Williams, director of product management at ANSYS. The only real way to test a complex antenna and its environment and take in continual change is a high-frequency structure simulator that can identify the signal-processing challenges, take the circuit design and chip configuration into account, and build a behavioral model that displays a realistic simulation of the physical processes involved, says Williams. That includes the design of the SoC, the structure of substrates and packaging, electromagnetic sources of interference and the potential for random error. It also needs to be capable of modeling and making recommendations about beamforming, power levels and data connections. The number of complicating factors involved makes it difficult to come up with a single metric that rates even something as direct as how well a radio signal reaches a particular target. Most 5G tests happen at the handset, but that is complicated because 5G signals, particularly at the higher frequencies, have trouble getting through the Styrofoam used as a base for the object being tested. Error Vector Magnitude (EVM), which measures how well a signal is modulated for broadcast and demodulated on reception, touches on only part of the whole equation. So there isn’t a good metric on which to base a test procedure designed to evaluate 5G chips, Foegelle says. Over-the-air (OTA) testing adds another problem. This is more complicated than just testing the strength of the radio. The standard metric of wireless connection quality, EVM measures how effectively a signal is modulated for broadcast and demodulated on reception, but it doesn’t take into account things that could cause two parts of a signal to arrive out of phase, such as the handset’s CPU clock. Even simple tests like how well a handset receives a 5G signal have unexpected little traps, like the unexpected interference of the supposedly signal-neutral material used to hold up the phone being tested. The phased-array and beam-forming have such a dramatic effect on the signal that most tests focus on them, but the shape or material of the device a handset or AP is made from, the plastic sheet used internally for protection and other design elements are relevant enough that testing the full system, not one component at a time, is the only real option. All those components are driven by firmware that makes decisions for the phased array, so the software also has to be included in verification of the array—another big departure from the norm. Future versions of 5G will be all digital rather than generating analog signals that are converted for broadcast. That will make the whole system more efficient by eliminating the conversion, but will introduce the specific algorithms used in firmware to make decisions about beamforming as elements to be tested. Software will play a very big part in basic functions, especially in identifying and tracking the source of connections in world of densely packed, rapidly changing cells, notes Michael Thompson, RF solutions architect in the Custom IC & PCB Group at Cadence. “You’ll need a little self diagnostic to test itself to see if there is an angle or change that will get better gain. Built-in self-testing makes sense, but you wouldn’t want it beam-searching all the time to try to get better gain,” Thompson says. That approach does put a greater onus on designers’ ability to build complicated beamforming and RF-source tracking into PHY layers that are already extremely complicated, Tadikonda says. That alone will increase the level of complexity involved in verification, making it difficult for organizations dealing with home-grown testing tools and processes to keep up. In 5G, however, software consists of more than just drivers to make other parts work. As designs evolve gradually from analog beamforming toward digital, the algorithms used to control the phone will become more significant parts of the RF and signal processing—which would make firmware part of the critical systems functions that have to be tested and verified, rather than just a way to tell hardware what to do when a button is pressed. “That’s another of the changes that will completely change not only the way you design the radio but how you test it,” Foegelle says. There are no accurate, relevant tests at the moment, and probably won’t be until more 5G devices hit the market and testing experts get the chance to evaluate not just the devices, but how well specific metrics reflect the experience of the end user of a device—and how well the tests those experts device reflect the right metrics. “It’s a pretty big shift in assumptions and how you’d approach testing, Foegelle says. It’s difficult or impossible right now even to devise new tests or evaluate specific metrics, however, because uncertainty over how well each component will perform and how they will perform in concert make it impossible even to establish whether a metric is relevant, let alone effective. “From the network operator’s standpoint, if I want to correct a drop in phone performance of 2 db to 2.5 db by changing my network, that equates to putting 25% more base stations on the network, so it’s significant,” Foegelle says. “Everyone is being cautious about estimates, but guesses put that number two or three times higher, so people are really cringing because the potential error in measurements means the numbers could be almost useless,” Foegelle says. The good news, however, is that much of the uncertainty will clear up and test engineers will be able to find measurements that might not be absolutely precise but will be accurate enough. 5G is definitely a technical challenge that will require changes in test and verification organizations trying to keep up. It also is expected to become a ubiquitous, always-on data dial-tone of the kind computer companies have promised many times over the years. If 5G is able to deliver that, end users will rely on it for more than texting and GPS. It will drive services they either cannot live without or will not tolerate losing if a signal disappears for a while—a level of service much higher than is typical of either cellular networks or WiFi networks today. —Susan Rambo and Ed Sperling contributed to this report. Stumbling blocks emerge for ensuring reliability of next-gen wireless devices. Rising costs, massive complexity, and challenges in testing and simulating these devices will require some fundamental shifts in the communications market. Assuring quality under changing conditions with shifting standards and use models is a major challenge.